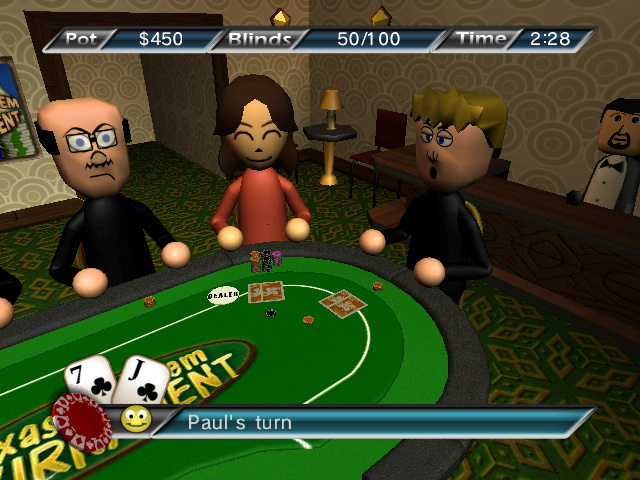 Does Digital Leisure’s latest WiiWare offering fold or make a clean sweep of the table? The deck is shuffled, the blinds are in and it's your move. Call, Raise or even bluff your way All-In with Texas Hold'em Tournament . You'll start off in the small Nevada gaming halls working all the way up to the Las Vegas Championship. 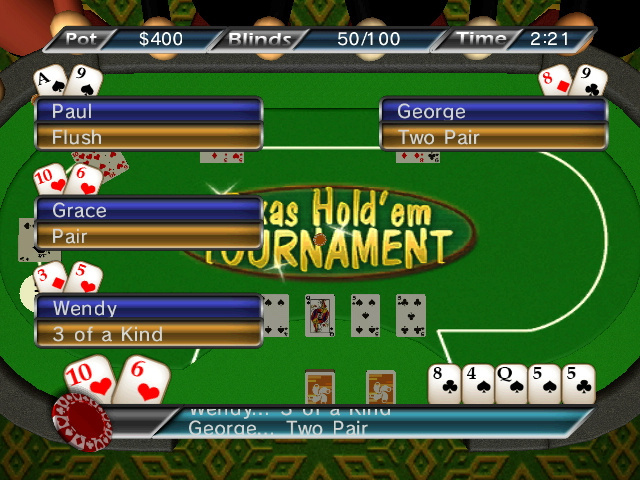 With multi-round no-limit hold'em gameplay there are hours of serious poker action awaiting you. Think you're the best poker player out there? Using the Nintendo ® Wi-Fi Connection service, start climbing the worldwide rankings by winning online tournaments and see how your poker skills stack up against the world by viewing the online Leaderboard. 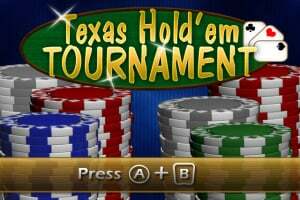 Texas Hold'em Tournament also lets you play multiplayer poker with up to five friends, and with full Mii support, you can really bring yourself to the table. looks weird.. Doubt i'll get it. This will most likely be crap, but at least they've attempted to implement online play. Who Knows, maybe this could be good. I wonder how it will do compared to V.I.P Blackjack. I think Digital Leisure just had a bad start. Unless Sudoku Challenge is also crap, i think they could bring great games to us. Wi-Fi multiplayer certainly makes this all the more tempting alongside Mii Support and considering it will probably 500 points, it could be quite good. Looks to me that Digital Leisure is Nintendos bargain basement WiiWare publisher with all of their games priced at 500. Now whether the games are worth download is debatable. I like Poker, and Texas Hold 'em is no different, but Digital Leisure? No flippin way! ... 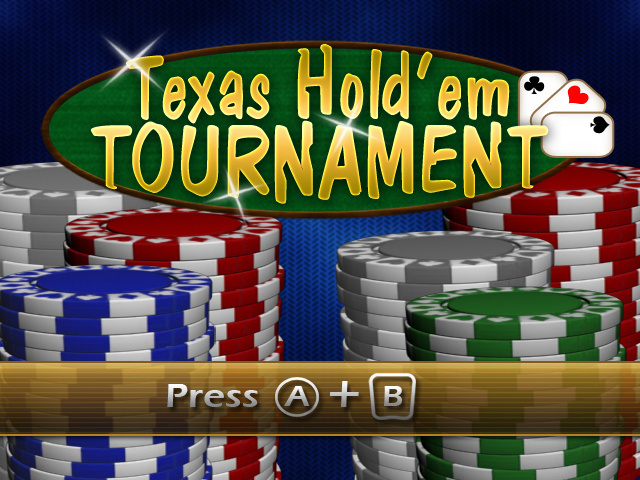 I can just get Pokerstars or something like that for FREE for my Texas Hold Em craving, or get a deck of cards. If they do this right I'll be playing a lot of Texas Hold'em. 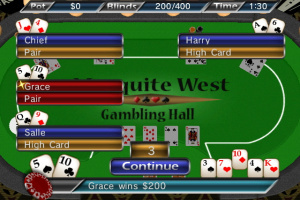 So how is this better than playing Texas Hold 'em on that Facebook app for free? I want this game on this friday plaese!!!!!!! Digital Leisure got Sudoku right, so they can get poker right too. I wouldn't be so quick to write them off. i will probally get it. ^ Hey, at least the presentations don't look as bad as Data Design Interactive's crap. @Nintendork: although I don't want to start and argument here, I would say it's on a par. Data Design's main flaw in what I've seen is the frame rate. Just look at this trailer for example. Just LOOK AT IT! ^watches video GAH!!!! You sure they don't use that video as a torture device? Anyways, I don't think the presentations are absolutely awful. They just use the same thing over and over and over again. Just look at this trailer for example. Just LOOK AT IT! I had that game for my SNES, back in the day. yes online! poker is my favorite card game. The only problem is, how will you keep your cards hidden from people in the same room as you? If they can solve this problem then i'll buy it. 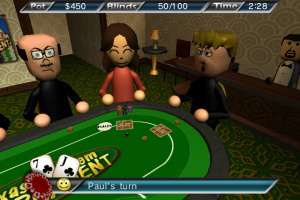 Why don't they make a poker game that uses the fact that the wii remotes have a speaker in them, you just press a button and the remote can whisper your two hole cards to you. You could play with up to four players then. No thanks. Although, I find it nice how they decided to incorporate Wi-fi. They clearly have some redeeming features/qualities. 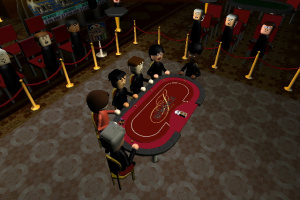 Now that they used wi-fi is a step forward to play money hold em, but a perfect solution would be playing for nintendo points. We could cash-in with buying some points, play for them and cash out back for money or at least spend them for new wiiware. 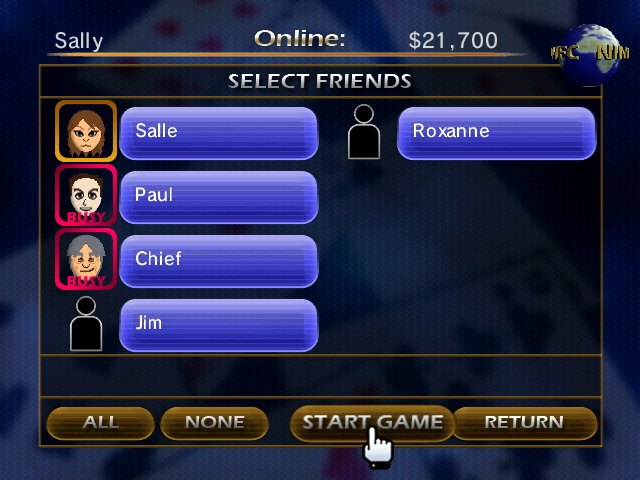 That would be cool Wii Poker client. "I was HOPING for something half way decent.."
Is it not half way decent? I'll get 2000 Points Tomorrow and plan to buy "World of Goo" and this game.. But I cannot find any reviews yet.. 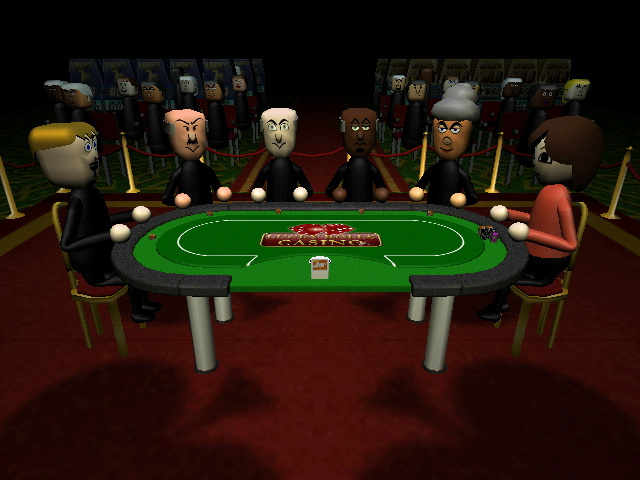 It would be great if someone made a Wiiware Texas Hold'em with Wi-Fi and Wii speak support. But this has the first half of what you're asking for. lol. And yeah, like Alex Says, I wouldn't write them off just yet. People could just as easily write off Aksys Games but if they did, they probably wouldn't have given Bit.Trip Beat a try... or at least not right away. 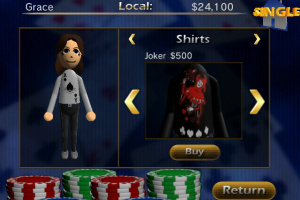 Now I got it and Id say it IS half way decent, just what you expect from a poker game. The graphics are relatively ugly, but I don't see any major flaws if you forget about that. 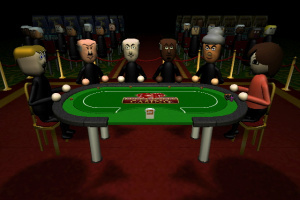 "Why don't they make a poker game that uses the fact that the wii remotes have a speaker in them, you just press a button and the remote can whisper your two hole cards to you. You could play with up to four players then." "But this has the first half of what you're asking for. lol." Yep : ) though it would be great to chat with friends while playing. "If I want to play "offline" with friends, I just take the card game"
I bought this also and yes, graphics are hilariously ugly. UI also could be better. 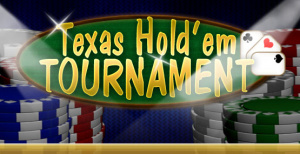 But it cost only 500 points and Texas hold'em is naturally what u expect it to be. I'd give a 6, I guess. The presentation is relatively bad, but the gameplay mechanics work pretty well. 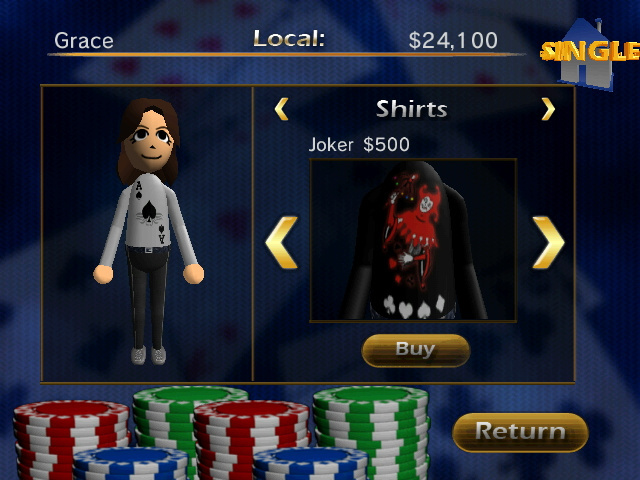 Theoretically, you could just play any of these free online poker games for pc instead, but I just like to sit at my TV, to control the game per Wiimote and to see my Mii playing . If you feel the same, its worth 500 points, but its not a "must buy". By the way, I got the impression that only a few people got this game yet, I always have to wait quite a long while until an online game starts - and when it starts, I often play against people I played against before. well I think I'll get it when it comes out, hopfully more people will to. Lots of online! Hmm I have to add something negative Im afraid.. in the time I played, there was 2 times a kind of bug (different kinds of bugs?) which stopped the game in moving on..
At the first time, the game just didnt start when enough players were there and it should do so.. at the second time, we were already in the "poker room" and we didnt get new cards after an opponent left the game. The connection was still there though, we made annoyed faces with our Miis towards each other . Probably, the game cannot handle it if someones connection breaks up in the wrong moment, or whatever. But maybe I was just unlucky that stuff like that happened 2 times in between a short period of time. Well I'll risk it any way for 5 bucks. Come on, release it in the US already!!! I've been waiting for this forever. 1.this game is coming out today. 2.you have a scary avatar! The graphics aren't very good. Still a good game. i give it a 6/10. Finally!!! The only complaint about this game is you should be able to have more of a choice on the level times, 3 min blinds are insane. I was never real big on the turbo games it makes for alot of donk moves. Maybe if you start out with more chips it would be ok but it's just two hands and then your popped with a higher blind level or one if everyone is really slow, your givin' 30 sec per person each street. So yeah that's my opinion and I would still give it more than a 5/10. 6.5/10 sounds about right. I like how they use your Mii's and you can buy clothes for your Mii. Oh yeah I also noticed there might be some kind of bug still. Everytime I get online in this game and then go back to the Wii menu I can't find my internet access point. I'm pretty sure it's this game thats doin' it. I have to disconnect my wireless router then plug it back in. Weird it never did this before. Before it would just disconnect and I couldn't connect back to it now the wifi just disappears. Maybe it doesn't have anything to do with this game but it is a coincidence. 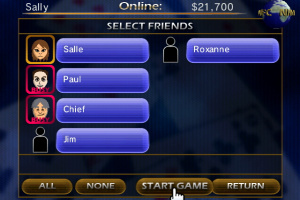 @ValLuvsher Wiii -- Unfortunately, Texas Hold'em Tournament does not utilize the WiiSpeak tools. Glad to hear you're enjoying playing! Okay so........ I'm really pissed off. I got to Vegas round 3. I was heads up with a guy who had around 4,000 chips and I had around 26,000. He disconnected and it said tournament canceled. This happened to me YET ANOTHER TIME in round 3, but differently. 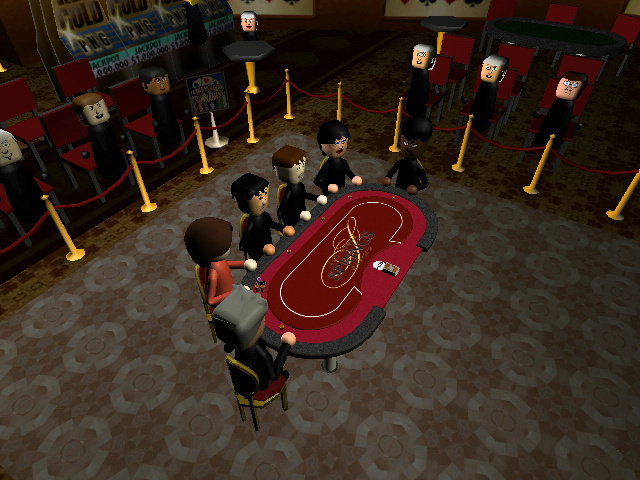 It would take me to a table with a bunch of computerized mii's, and I would be out of my game. I have been disconnected countless times in round 2 of Vegas. I have spent so much goddamn time trying to get this money so I can get a Tux and a suit it's ridiculous. I've chucked my wiimote way too many times because this goddamn game keeps disconnecting at the worst times. 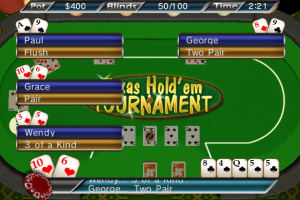 To top it all off, I usually get disconnected after I win a huge pot. 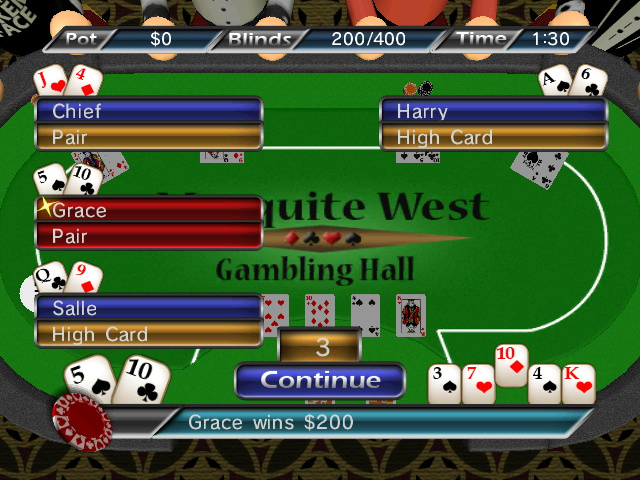 I would have won 5 Vegas tournaments by now if the game didn't glitch. I find this highly retarded and really irresponsible of Nintendo. I've been a Nintendo fan till the end, but this is just about the dumbest thing I've ever seen them do. 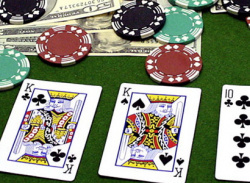 The game is really fun, and should be really good, but if you're any good at poker and make it to the end, you're going to be really pissed off when you're game disconnects. My internet is flawless and I don't have any disconnecting issues with ANY other wifi games, nor do I have any internet issues. Does ANYBODY have this problem or have a SOLUTION? Good Luck, and see you at the tables. ShivihS, I can totally relate. I too have been "canceled" out of Round 3 Vegas, when I was on the verge of winning. It seems like some little creeps have figured out how to do it, and when they lose, they cancel, so that person who beat them gets nothing AND loses the entry fee. Another weird thing I noticed is that in the "Selecting Players" screen, where your opponents pop up before the game, sometimes certain players have a "thumbs up" icon next to their name. What's that about? I don't have one, and I'm ranked in the top 50 players for career winnings. Not trying to brag, just wanting to know what the icon means.